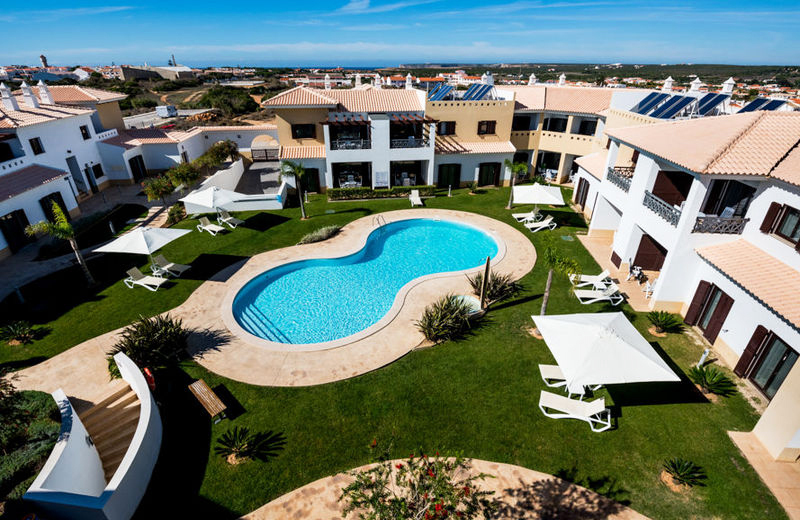 Nomad Surf Camp - Vale Figuieras, Algarve お客様の全体評価： ★★★★☆ 4.2 Cに基づき 64 レビュー. Bungalows completely fully booked for the the month of July 2016 . Only Superior Rooms and mixed dorm available. We have staff from Swizterland, Australia, South Africa, Spain, Brazil, France, Sweden, and Portugal. A Surf school package is for people that want to learn how to surf or to progress in surfing. Special surf course program in a friendly ambient with people, who love surfing! Have fun! ✔ Transport on Fridays evenings to Lagos or Sagres. Discount 5% on the 2nd week and 10% on the 3rd week. On high season arrival on Sundays. In low season you can do less than one week and you can also start any day of the week. 3 and 5-day packages also available. A local surf coach will bring you to the spots with the best conditions of the day, no coaching, just enjoy pure surfing! Autumn and Winter are the best time the year for waves. Surf and Yoga it is the best combination ever! Start the day energized and uplifted with Yoga, or relax and stretches all the key muscles after surfing. Yoga lessons for all levels. A package for people that love Yoga and nature. And that is all they will do all week enjoy beach and landscapes of Natural Park during the day. Yoga class for all levels. A Kite Surf package for beginners, intermediates, or advanced that want to improve their riding level, learn to jump or go unhooked. The kitesurf is done at the perfect location, in a beach/lagoon on the south coast only 30 minutes from the surf house where the sea is flat and good wind. ✔ 5 Days of Kitesurf classes (15 hours). Material included. This is our most exclusive package. Ideal for families with children or couples that want to relax and spend a week of surf taking care of their bodies and doing different healthy activities apart from surfing. One of our guides will drive you to discover a bit more in-depth the beautiful Costa Vicentina, its History, its traditions, and its people. ✔ 4 Days surf school or surf Guiding. ✔ Material included for surf lessons. This package is for those companions and non-surfers only needing accommodation (place to sleep and eat)in the Algarve. We offer surf courses for all levels. Book an Accommodation in the Surf Camp or Surf Resort and get the Best price for your Surf Course, just 125€! Surf Guide without Accommodation. Our local surf guide will help you to explore the west and southern coastline. He will bring you to the best surf spots depend on the conditions of the day. If you would feel like you still want some theoretical lessons, let us know and we change your Guiding for a Surf Lessons for the Intermediate/Advanced student. Pick up at other location may be organized as well. In high season Guiding is possible for a group of 3 or more persons. Book an Accommodation in the Surf Camp or Surf Resort and get the Best price for your Surf Guide, just 125€! Longboards, Mini mals, Funboards, and Fish models. A Huge selection of short boards available. Firewire boards for rent. New Ripcurl wetsuits. "Excellent stay, great staff, beautiful location"
"We love our staying so much! the food was amazing! one of the best we eat in Portugal.and everything was perfect , thanks very much for hosts!" "I have been there for a week, the place is amazing, quiet and beautiful. Russo and Tonya are so friendly and thoughtful. Also the beaches couldn't be better. I have enjoyed the surf lessons very much, I recommend everyone to go there! " "I spent a week here in December. It's a really nice house with a spectacular view over the valley. We had the beach and the waves almost to ourselves. Tonya and Russo were super nice and made sure I had everything I needed. I had a really great time and will definitely be back. Obrigada. " "We spend a really nice time at Vale Figueiras Nomad Surf Resort. We choose to be out of the touristic season and we found a really quiet place, isolated in the Algarve Nature. The family running the resort was really nice to us, they opened their space as if it was ours. We have some great surf conditions, and we were changing of spot according to the swell and wind. The place is adapted for a family, and the owners have made us discover local food specialty and places too. This was a very good trip !" "It was an amazing stay with the surf camp! Everybody was really friendly and we appreciated it a lot to be at this place! Surf lessons have been also great and we would definetly come back. Thanks guys." "My 13 year old son and I had an excellent 4 night 3 day surfing experience. Hosts are fantastic people! Staff is also made up of very cool and laid back Surfers. Food was absolutely excellent and plenty. They really go all out for the best food for breakfast, lunch, and dinner. Also, unexpected yet very appreciated, is my portion of surfing instruction was subtracted from the balance because on the first day I had a freak accident and injured my foot so I couldn't surf. They also offered to drive me to the doctor, which was very nice but unnecessary. Best part is after 3 days my son was really surfing and safe to say he has the 'surfing bug' and he can't wait until our next surfing holiday! :) We would very much like to return in the Spring!!" "Good teachers, nice and uncrowded surf Spot. The accomodation was clean and the staff very helpful and nice : )"
"I've just spend a week in Nomad Vale Figueiras and it was a pretty good experience overall, The staff is very friendly and helpfull, the food is quiet good and the camp is located very close to one of the best surf break around (few people, good waves, rights and left breaking over sand and/or smooth rock bottom). The bed (bungalow) i've had could have been a bit more comfortable though and you better like dogs since there's a bunch of them (but chill ones) around the place! Good place to go with kids altough! Go for it"
"nice people, good vibes and an amazing beach what else are you looking for !? cheers and see you ! "It was a wonderful location with lovely people and nice dogs. It was family friendly and everyone had his freedom. " "I loved everything. Great staff, atmosphere and great food. I am coming back next year"
Thank you so much, Marloes! Hope to see you next year! "An amazing family environment with dedicate and passionate instructors. Great week, will definitely come back again." Thank you Pedro! We ll be happy to see you again! "Everything just PERFECT and GREAT, I really had a great time and enjoyed it. The place is really nice located in the national part. In the surfing camp, everything was perfect food delicious, accommodation nice and clean, surfing lessons great. " "Highly recommendable experience, Russo and his team do an amazing job in combining a great number of elements to make a remarkable experience for their students. The teachers are very educational and patient, the location is amazing, the waves and the beach are sublime, the atmosphere is fun and relaxing, the food exceeded my expectations in terms of quality and quantity, the sleeping area was sufficiently comfortable on the low budget option I chose, I suppose even better on the higher end accomodation option. They really make every effort to make their guests feel welcomed and cared for. All in all, a place to go back to. That was my experience and also I didn't meet any other people taking the lessons complaining about anything about their experience... it's nice to see that there are still places on earth where experience satisfaction can be achieved at reasonable prices. Well done team! " "I spent such a great time in Vale Figueiras! It is more than just a Surfcamp. You can have nice Yoga classes in the morning or in the evening. And I really loved the food! Thank you so much Tonya and Rui! You have a wonderful place with warmhearted people. I try to come back as soon as possible...!" "I really enjoyed my stay at Nomad Surfers, it's a little tricky to get there with the public transport, so I would definitely recommend renting a cheap car at the airport, but once you're there it's great, the crew are really friendly and accommodating, the food is great and the bungalows are perfect. The surf lessons for the intermediates include video feedback and the instructors are very good. I will definitely be coming back, and I will always recommend this camp to anyone who wants to learn to surf in the Algarve! " "We spent a perfect week at Nomad Surf Camp Vale Figueiras. I would recommend to everyone to spend few days with all the team for those who like surfing and being disconnected during few days. Everything was perfect. I'll come back for sure !!" "Tonya, Russo, Maria, Irina, Ana, Luis Miguel, and Luis are amazing people, here at Vale Figueiras. They opened their house, were very welcoming, dragged us to really cool places, gave us so many advices and hints about how to surf, were very accomadating, and were contributed to have such good vibes in the camp. We met really cool people there, all having different journeys, road trips, expériences, but whatever. We shared the same will about being in a really relaxing place with some great people, and having surf. " "I stayed for one week in Vale Figueiras Surfcamp and it was a perfect stay. Everyone is so kind, it was really cozy in the camp, I had a lot of fun. Breakfast was great, there was everything one needs, fruits, joghurt, cereals, eggs, bread etcetc. Big lunchpackets everyday and perfect self cooked dinner, alway healthy an delicious. I was really glad about the average age beeing about 28. There was the possibility to party, too. There was really nothing I could complain about! " Thank you very much, Maren! We appreciate=) Hope to see you again!! "This has been such an awesome week! First time surfing the nice, funny and experienced instructors made it a great experience. The surrounding is breathtaking beautiful. The food was yummy, the room we had was great, the weather was good what else could we wish for? Thank you, Tonya and Russo and everyone else of the team for this! We'll be back!" "Great instructors (props to Luiz), staff, atmosphere and food, what else ?" Todo perfecto!! / Everything was perfect!!! "Profesionalidad, seguridad, atención perfecta y simpatía a raudales. No se puede pedir más. The staff was very profesional and very friendly and made us all feel safe while learning to surf. Special thanks to our fantastic teacher Hannah who was incredible!!! She is one of a kind!!!" "It is a bit difficult to arrive to the place but once you are there, the climate is amazing. Everybody is really polite and light hearted. Even though neither my colleges nor me had any idea about surf, the monitors are really good teachers and they were able to teach us in one day. It is really easy to learn with their help. Additionally, the surf camp is incredible with lots of activities to spend time in the evening having fun with new friends. By the way, the breakfast is unique. Really recommendable. La ubicación es un poco difícil de encontrar, pero en cuanto llegas, todo es increíble. Todo el mundo es super educado y muy buena gente. A pesar de que ni mis amigos ni yo sabíamos nada de surf, los monitores nos enseñaros en apenas un día a coger las olas. Es muy fácil aprender con ellos. Además, el campamento en sí es increíble con muchas actividades para pasar el tiempo por la tarde o noche con nuevos amigos. Por cierto, el desayuno es único. Totalmente recomendable"
Best secluded surf in Europe brought to you intimately by local family! "Best nature experience in Algarve with world class waves ranging from beginners breaks to full on high walled barrels peeling clay on generous off shore breeze days!!! The evening meals plush breakfast and well organized social events offer everything a holiday could want. Best deal and experience in the Algarve ! Can fully enjoy it all without a car too!! Bring your appetite and lust for surf! You won't leave disappointed! Most people extend the visit if space permits. Slept well, even in a 10 bed dorm!" "Great experience, great venue, great hosts. Highly recommendable! " "I was there with my friends spending just two data. it was an amazing experience. A bit short uf I am sincere. Once you are there you want more and more. People there is so much kind and friendly. Very good instructors for the surf lessons, always trying to help you improve your surfing skills (un my case, nonexistent at first). Definitely a worthy experience. We'll repeat it! " "We stayed just a few days but it was a wonderful period. Perfect surf, service and people!! I really would like to come again!" "This place is amazing. The people, the location, the beach and the surf. I'm a beginner and my instructors were really great! (Thanks Hannah and Jesse) I really felt like home and I highly recommended this surfhouse for everyone who wants to spend lovely time chillin and surfin :)"
"Ambiente familiare e amichevole dove si viene subito coinvolti nella quotidianità della casa. Immerso nella natura e distante dalla confusione e dal trambusto cittadino è un posto che invita al relax totale, con sistemazioni semplici, ma non per questo poco curate. Lo staff è molto disponibile e cordiale, propositivo, ma il tutto viene svolto con le giusta calma che caratterizza questi posti, senza troppa frenesia. Anche il cibo è ottimo, casereccio, ma buono. Insomma, dopo il breve periodo trascorso qui, ho avuto difficoltà ad andarmene! " "Nice experience for all family. Very friendly stuff and amazing location in a familiar contest. " "From the first moment you arrive in this camp you will find yourself surrounded by a deliscious familiar ambient. This is a lovely place full of amazing people that will make you feel like at home and it's the perfect place to start learning how to surf too because all the numerous instructors are friendly and very well prepared! In here you will also find again the connection with your body and the nature that surrounds everything. Good vibes only. It has been my first experience in a surf house and, after this one,I will surely have other experiences like this in the future! A Special thanks to Tonia and all her family and to all the instructors,especially Andy,Luis and Hannah." "We spent a week at nomad surfers and it was great. An amazing location (we stayed in a room in the country house) not far from Val Figueras praia, one of the wildest beaches in the area. A van takes you there and to the main building where you have dinner. Good food and very nice surf instructors. Tonia and her family are very friendly. To be recommended!" "Ambiance à la cool, chambres confortables (partagées), Buffet de petit dej à volonté, Russo est un super cuisinier! Spots et plage sympas pour les intermédiaires, profs tops (thanks Luis)! Accueil top, bières pas cher, bref je recommande vraiment!! "Me and my friend had an amazing time at the Nomad Resort! I would absolutely recommend it. The surf teachers were super nice, knew what they were talking about and really took the time to teach you stuff. It was pleasant that all food was included so you would not have to worry about any of that. Great location of the camp as well: in the middle of nowhere, so very quiet and at night an awesome view on the stars. Cannot wait to go back. " "Simply a great place to stay! the staff is very kind and helpful! They also cooked for us delicious dinners...I had a great week! Fully recommended to everyone! see you in the future guys! Stefano"
"Si vous aimez la nature et le calme vous serez gâté! Nous avons passé un très agréable séjour tout était parfait. Les repas sont délicieux et copieux, nos hôtes vraiment adorables. Jeune couple nous avons pris une chambre avec salle de bain très agréable et propre. Les cours de surf et yoga étaient juste géniaux grâce a des professeurs passionnés et très avenants. Merci à la Team nomad surfer Vale Figueiras pour ce séjour délicieux. Tiphaine et Franck "
"Buenos profesores de surf (gracias a los dos Luis por todos sus consejos) magnificas playas, buenas instalaciones en medio de la naturaleza y cerca de la playa y un trato atento y familiar. Nos alojamos en el resort donde pudimos disfrutar de cenas caseras a cargo de Tiniña y de un ambiente muy familiar. 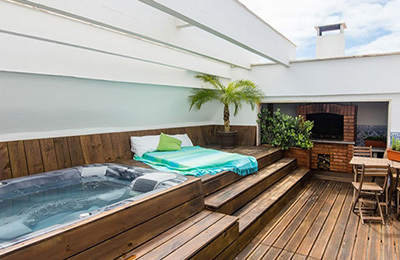 Un sitio perfecto para familias, parejas o grupos de amigos amantes de la naturaleza y el surf. Ademas admiten perros. " "Nice place in a nice quiet environment. The instructors really nice people and all the staff always very helpful. Breakfast outstanding! Definitely I'll repeat, I had a great time. " "I had an amazing time learning how to surf! Off course muscles were sore after a few days, but once in the water that was soon forgotten. Every member of Nomad was extremely friendly, always willing to help, talk and give advice. Relaxing armosphere, great food, fantastic holiday Mieke Vleugels"
"I had a wonderfull time with you guys..... The group was small so the teacher (Luis) could give us a lot of personal advice, i liked that very much. They were always on time, but also we had enough rest between the lessons.... I will be back for sure ;)"
"Stayed end of May to begging of Jun 2017, Intermediate class as I have an experience. How surf camp placement of classes and lesson is very defined. Beginner class people is able to learn a basic logic and how to take off and cares a lot for safety, Intermediate is able learn the correct position, how to lead a wave, get out by using current for ex. and it was really valuable moment for me. All stuff, instructor are very nice and enjoyed meeting people from lot's of countries, having a BBQ, try get more skill to catch the wave together. It's unforgettable. It was so great. " "Wow! Very good experience! Nice people and awesome surf lessons! My friend and I really liked our experience! " "The location is great, in the middle of nature is perfect for a relaxing vacation. People are also very friendly. I didn't like it that wasn't water in the pool and it was a facility that I paid for. Also the fact that I could drink tea or coffee only at the breakfast was something that I didn't appreciate. Overall I spent a really good time and thank you for this! " 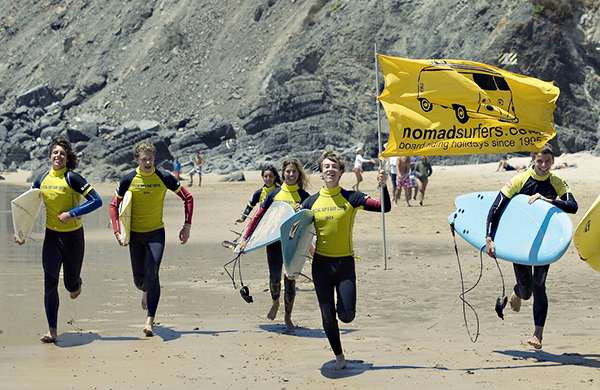 "I had an amazing 4 days surfing with Nomad. Good communication during the booking process and leading up to arrival. Although it is pretty much a remote place in the countryside in Algarve, it is easy to find it. The place allows you to really focus only on your surfing. The accommodation and the rooms were exactly as described, nothing fancy but clean, comfortable and with everything you need. The surf school is well run and I cannot rate the quality of the instructors highly enough and the kindness our the whole team at the camp. We arrived as complete beginners and 1 of us was advanced. After 4 days, everyone was standing having fun surfing, the advanced friend is even more advanced^^. The attention and fun we received from our instructors was outstanding. Thank you again for this memorable surfing experience. We cannot wait to go back and visit all of you! CHEERS! " 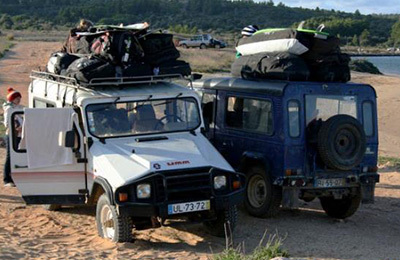 "My boyfriend and I had a great time at the Algarve Nomad Surf Camp. Food was delicious, surf instruction was top notch. Camp conditions are a bit rustic but this was easily overlooked by the great vibe of the place and the wonderful staff. Thanks for a fun week." "I had the best time at Nomad. It's my second time and I plan to come more often. I stayed at the house with my own bathroom. But you can also stay at the camp. Food is fresh and good and there is a friendly welcoming ambiance. " "I went by myself in May 2017. I was a bit afraid of going somewhere by myself but it was totally awesome. There was no time to worry about it we spent most of the day at the beach and after the dinner I was so exhausted that I just went to bed. I was lucky that the camp was almost empty at this time so I got my personal surf instructor. It was my second time trying surfing and it was really great, I improved a lot during one week. Definitely recommending it. When I'll go there for the next time I would probably stay in Resort not the Surf Camp, however, that was not a problem at all." "If you like surfing the best waves of the day don't mind eating the superb local food, and staying with true local experts, go there"
"Centred bang in the middle of a national park, surrounded by rolling hills and pine forests and no more than a 5 minute drive to a cracking surf beach. As if this isn't enough, the nomad surf camp is welcoming, clean, chilled (when we weren't partying) and run by 2 of the planet's loveliest people Russo and Tonia. It doesn't end there either, the food was delicious and plentiful and the cherry on top was that the surf instructors are the best I've come across. I learnt more in 3 days than I have in 15 years of self teaching. We're definitely coming back! " "It was a pleasure for me to take surf lessons by the nomad surfers. Friendly and relaxed guys makes me a unforgetable trip. Thanks! Always again "
"Our stay was really cool, we had great yoga classes in the morning near the pool with Rose, then a wonderfull breaksfast, and after an amazing surf time and chill time too at the beach! We learned a lot with Luis and Hannah, such crazy good teachers! Aljezur is an amazing place, wild, peacefull! And the team of the camp and the owners were very kind! We met there incredible people! THANKS A LOT! <3"
"I felt really welcome at vale figueiras, the surf coaches were super cool and the overall ambience was great. Had the best week! " "We spent 5 days with our kids and we enjoyed a lot! Tonya and Rui are very welcoming persons and make everything possible to have a good time. "Como siempre, una semana fantástica, lástima un poquito más de descuento para los que llevamos tantos años repitiendo, jeje. Muchasgracias por todo"
"I´m realy suprised about the open and easy way to stay in vacation and to learn surfing. Best conditions to relax and do surfing. My daughters with 11 and 13 years enjoyed too, also without speaking anything words in english. Sebastian from Berlin "
The camp was clean and can highly recommend it. "Hi I am just back from a week in VALE FIGUEIRAS and I loved it. The tuition was excellent and particularly for beginners. Every member of staff at the camp was so friendly and the food and lunches were excellent. The camp was clean and can highly recommend it. Will definitely be back." "Hi Jose I would just like to share our feedback on our summer camp in Portugal. It was out first ever surf camp and went in somewhat blind and I followed your judgement and was happy I did so. We really had a great, great time. The house with our private bathroom was perfect and exactly to our taste and liking as a family, (the camp’s main house wouldn’t have been right for us) the food was wonderful but mostly it was the teaching and the teachers. The teaching was professional, progressive, motivational, methodical and fun, really good and exactly what I was wanting as any prior teaching I’d had had all been too lose and random. All the teachers were all so nice and the vibe was perfect and we were so touched at how they were all with our son leo, he caught his first big wave under their great judgement, really cool and inspiring. I wonder wether it would be at all possible if you could pass on a message to Sonia, one of the teachers, I never got to say a big thank you for everything and a goodbye from us. Once again the surf camp was brilliant and we will only have good things to say about Nomad Surfers, we are even thinking about going to your Bali surf camp. Best of wishes”"
"Ha sido una experiencia inolvidable. Si hablase de hacer surf como deporte, os diría que el sitio es magnífico, la situación al lado de la playa y los monitores son buenísimos. Son gente que viven para esto, disfrutan haciéndolo y los conocimientos que tienen se notan que han sido adquiridos de muchos años de experiencia... es su pasión. Pero yo voy más allá...era mi primera vez que hacía surf, no tenía ni idea, ni siquiera sabía si me iba a gustar...pero todo eso dá igual...la mayoría está en las mismas condiciones, se trata de una experiencia de un grupo de gente que convive una semana, unos viajan solos, otros con un amigo..españoles, franceses e italianos son la mayoría...no es el típico sítio donde aparece un grupo de amigos de 21 años de la universidad....la media de edad y sobretodo la media cultural es mucho mayor(por lo general es gente que ha viajado bastante y busca experiencias nuevas) Si estas solo o con un par de amigos como mucho, recomiendo este sitio...vais a vivir una experiencia única con un grupo de gente magnifico, todo muy bien organizado, unas playas increibles, las instalaciones son preciosas y totalmente equipadas. Espero que esta opinión ayude a gente a dar el paso." We made a lot of progress!!! "hi guys, just wantet to say thank you again. sunday morning when we checked out we were a little bit in hurry so unfortunatly we could not say goodbye to everyone. special greets to luis, who was a very good surf trainer, we made a lot of progress and it also was very funny all the time. also the cook did a excellent job, every single day there were fantastic meals served! again, thanks to all the staff and the other guests for having a great stay! greetings from austria"
"Dear all, It has taken a while to get back to reality here in Switzerland. Since we left a couple of weeks ago we haven't stopped thinking of you all and the surfcamp. We wanted to let you know that we spent a fantastic Holiday, we enjoyed the quietness, the simplicity, the authenticity, the good food, the region, the great surf lessons (many thanks to Peter! you gave me such incredible tips that I need to learn further...), and the support and attention from you all with our both girls Marine and Amara. Believe me you all, you live in a little paradise, we already miss it. We were so well taken car of from the pick up in Lagos by Luis, to the drop off in Lagos, by... Luis.. again the day of our departure. Russo, Tonya, Luis, Eduardo, Pedro, Peter, Maria, Giusepedro, Julie, and all staff, cheers! Well, in short: A BIG THANK YOU FOR WELCOMING US AND FOR THE GOOD ENERGY FROM ALL OF YOU! WE SPENT SUCH A FANTASTIC WEEK THAT WE WILL NEVER FORGET! Matthieu, Daniela, Marine, Amara St Légier La Chiésaz Switzerland"
"Hello Julien and Team nomadsurfers! I have spent a week extra! special dedication to Russo for his sense of hospitality and joie de vivre Riki, Prof. surfing for its high quality education (he m has even learned to surf foam back to the beach!) and his accent cut with a knife Luis training for these before and after surfing always with an eye on each and pick up rides in the hills deserted. And and their unconditional love for all to the ocean and the party that they know so share! . I forget also the course without leach, good evening to Sagres, the tasty dishes Pedro, animals surfcamp biend and others ... I said goodbye and thank you very much."